Cara Delevingne boyfriend: Model "torn between Harry Styles and Aki Omoshaybi"
Home / Entertainment / News celebrities / Cara Delevingne boyfriend: Model "torn between Harry Styles and Aki Omoshaybi"
We didn't see this one coming! 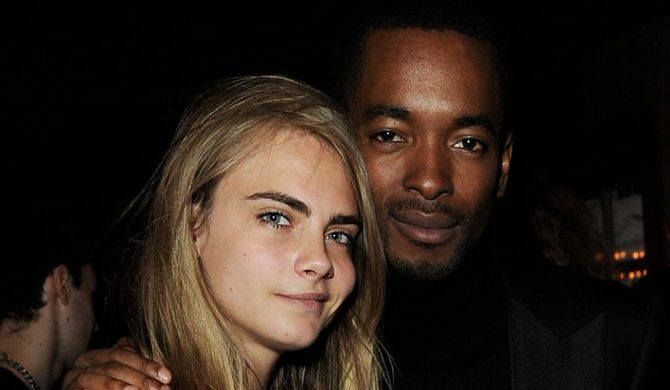 While we all thought Cara Delevingne was smitten with Harry Styles, she's reportedly fallen for actor Aki Omoshaybi. But now the model turned actress is apparently keen on both guys - so it looks like she's got a pretty big decision to make. She's one of the most beautiful women in the world, so it's no surprise Cara Delevingne has two men fighting for her affections. Amid all the rumours the 21-year-old model is dating Harry Styles, she's also been getting close to Nigerian actor Aki Omoshaybi. Cara and Aki star together in new movie Kids In Love (how apt) and it seems they've formed a close bond on set. Though she's not serious with either guy, it seems they're both keen for her to be their girlfriend. On a recent night out at London's Café Royal, Aki was determined to dismiss rumours that Cara had found love with Harry. He insisted: "Cara is definitely not dating Harry. People always assume she’s dating the guy she’s seen out with because she’s so friendly." Cara and Aki were later spotted leaving together in a taxi, looking rather coy. Aki - who's about as gorgeous as Cara - is a theatre actor who’s starred in productions including Follies and Children Will Listen. He also danced for the Queen during the World War II commemorations on the BBC and is predicted big things. Aki has tweeted about Cara a number of times from the set of their movie, which is thought to be about rich kids who live a wild lifestyle filled with parties and drugs. But Aki has some tough competition in Harry, who was introduced to Cara through mutual friends last year. The pair were thought to be hooking up after they were spotted on a date at the theatre last month, before they were snapped hanging out backstage at London Fashion Week. A source told Look magazine: "Cara has two men fawning over her at the minute and she keeps talking about how much she loves it. "What girl wouldn't? She's really affectionate and open with her feelings and loves that these guys are falling for her." The insider added: "On one hand, she has one of the most fancied guys in the world calling and sending her messages daily and on the other she has this fairly unknown actor, whose creativity she adores, begging for a date. "She's a little torn, but Cara is just being herself and if both guys can't handle that, she'll wave them goodbye. Cara is a free spirit in more ways than one." Prince Harry linked to Cara Delevingne as relationship with Cressida Bonas "on the rocks"
Not so Great Gatsby: Cara Delevingne snubs Leonardo DiCaprio at Cannes? !